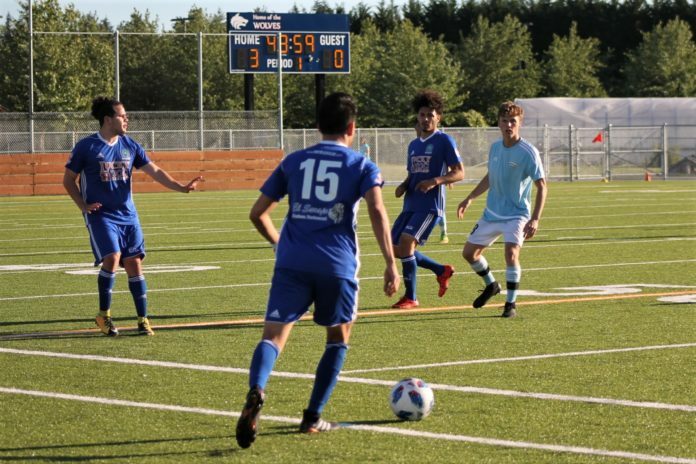 The Oly Town Artesians maintained a solid lead and came away victorious against the Spokane Shadow with a final score of 4-1 on Saturday night at Black Hills High School. The match was a battle of grit and consistency with Daniel Gonzalez and Kahlil Bredeson dominating the first half. Gonzalez and Bredeson each scored within the first 25 minutes, giving the Artesians a 2-0 lead. The pressure was on throughout the rest of the first half, as Gonzalez finished his second goal of the game, bringing the Artesians to 3-1 minutes before the end of the half. Spokane earned a penalty kick and scored against keeper JJ Olson in the second half which brought the score to 3-1. The Shadow gathered momentum after their first goal of the evening, but the backline consisting of Scott Penner, Marcos Borja, Collin Tate and Crisantos Chavez fought hard to protect their lead. Segovia scored the final goal of the game in the 90th minute to bring Oly to 4-1, which lasted till the final whistle blew, giving the home team their second win of the season. Head coach Matthew Herrera said overall it was a great game and that he was pleased with how his team played. Oly Town currently stands in first place in the Evergreen Premier League’s Coastal Division, two points ahead of the Seattle Stars. The Artesians will travel to Kent next Sunday, June 10 to face the Stars, then return home on Saturday, June 16 where they will face off against the Tri-City Alliance. First kick is 6:00 p.m. at Black Hills High School. Read more about the Oly Town Artesians here and check the schedule for upcoming games.